DETROIT — The Michigan Council of Women in Technology Foundation has recently expanded, developing a West Michigan presence to further its mission to inspire and grow women in technology throughout the state. Four sponsors – Meijer, Open Systems Technologies, Gordon Food Services and Spectrum Health – have now joined the nonprofit from Michigan’s west side, to contribute to furthering the cause of diversification in the STEM field. Rob Geer, MCWT Foundation’s West Michigan mission director, says there is a concentrated group of businesses and entrepreneurs in cities such as Grand Rapids, Benton Harbor and Kalamazoo committed to helping build a more vibrant and diverse IT economy in Michigan. MCWT hosts events in the Grand Rapids region that educate and empower business leaders and other influencers on IT trends and issues. Registration is open for a private screening of the movie “CODE: Debugging the Gender Gap” Friday, Sept. 30 from 6:30 to 9:30 p.m. at the Bytwek Theater of Calvin College. Mutually Human, Calvin College and MCWT partnered to bring the movie to MCWT members. The film discusses the need for more female and minority software engineers, analyzes the reasons for the dramatic digital divide, and highlights breakthrough efforts to bridge the gap. Other upcoming events includea Girls Rock IT program on Oct. 15, and a ConnectNet social later this fall. For more information on events, membership and partnering, contact Rob Geer. MCWT Foundation is powered by an active core of dedicated volunteers and 700-plus members, providing support to women at all stages in their lives. 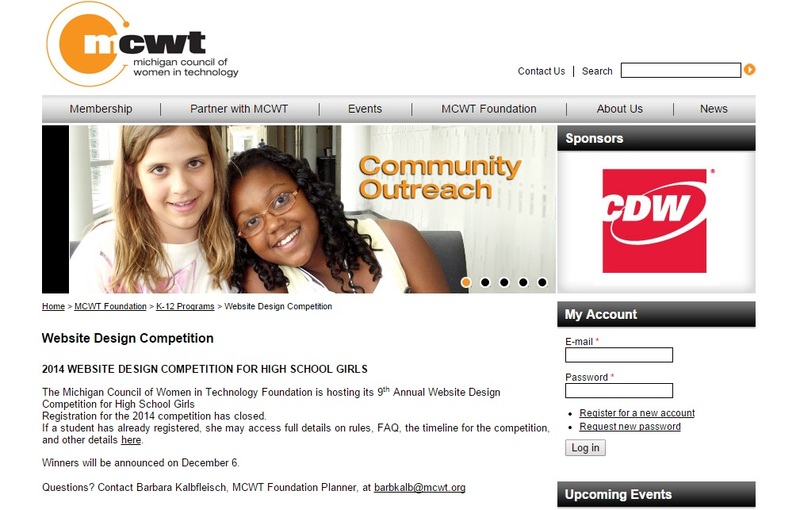 From Camp Infinity summer technology camps to after school GET-IT clubs, to website design competitions and scholarships, MCWT is helping equip the next generation of girls and women with the tools and experience to help them succeed and drive the state’s economy forward more rapidly. For mid-career women, MCWT hosts monthly educational events and networking opportunities; online learning via Lynda.com and WebEx; and a formal mid-career mentoring program to help those re-entering the workforce, making a career change, or needing guidance to get to the next rung on their career ladder. The Michigan Council of Women in Technology Foundation strives to inspire and grow women in technology fields, aspiring to make Michigan the No. 1 state for women in technology. The organization supports Michigan’s female IT workforce, students, corporate partners, schools and the overall community with programming, scholarships, networking, learning, mentoring, and technology experiences. Find more information at www.mcwt.org and connect via LinkedIn and Facebook.